Lets you manage servers and workstations from your local PC. AWRC does not require that you install any software on the remote machine. This turns the software particularly useful for accessing remote machines without any previous preparation. With AWRC you have the knowledge and capabilities to do virtually anything on the remote computer. 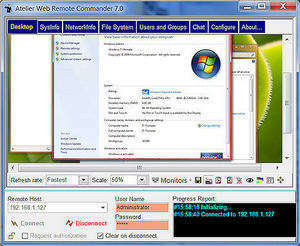 Atelier Web Remote Commander 9.1 is a shareware program and can be used as a demo to try the software until the free trial period has ended. A full version of the program is available after the trial period ends. For security reasons, you should also check out the Atelier Web Remote Commander download at LO4D.com which includes virus and malware tests. Additional screenshots of this application download may be available, too. Atelier Web Remote Commander has a presence on social networks.